NJ Paleo Girl: O.N.E. Coconut Water Recall! ONE World Enterprises is recalling O.N.E. 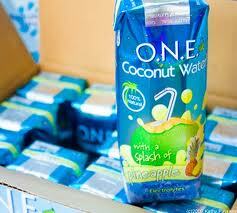 Coconut Water, packaged in 11.2 oz. Tetra Pak cartons with Lot code 12E1004, UPC 894991001104 and Sell-by date of May 1, 2011, due to the potential oxidation of the product that may permit the growth of mold. The affected product is isolated to a single lot number and the company is currently utilizing Corrective And Preventative Action (CAPA) procedures to identify why this problem exists, which was discovered after receiving a small number of consumer complaints. Test results for pathogens were negative as tested by the Georgia State Department of Agriculture. Dates and codes can be found stamped on the top of the packaging. The affected product was distributed to various retail outlets in Florida, Georgia, Indiana, New York, South Carolina, and Tennessee. Currently the company is working with the Georgia State Department of Agriculture to determine the cause of the consumer complaints. The recall is being conducted in cooperation with the U.S. Food and Drug Administration (FDA). To date all internal testing at the manufacturing plant indicates no contamination. Therefore, the company is investigating possible issues that may have occurred during transport thereby causing potential oxidation. Consumers should return any of this product to the retail store where it was purchased for a full refund or credit. Consumers with questions may contact the company at 888-ONE-COCO (888-663-2626) between 9 a.m. - 5 p.m. Pacific time, Monday - Friday, for further information.